A Boston homicide detective investigates the brutal murder of his daughter. Along his investigation, detective Thomas Craven, discovers a corporate and government cover-up is tied into his daughters death. Craven must move quickly to solve the homicide before a contracted agent cleans up any loose ends that would leave a trail back to the government and corporations misdoings. 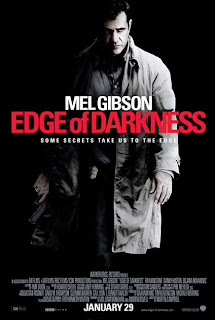 Seeing Mel Gibson back on screen again is the number one selling point for "Edge of Darkness." Directed by Martin Campbell (Casino Royale), the crime thriller doesn't tread any new ground for Gibson, however I can't lie and say seeing him back in action wasn't nostalgic. "Edge of Darkness" has all of the right components, unfortunately when all is said and done, they don't amount to much more than a forgettable film. Based off a 1985 UK television series that spanned 6 hour long episodes, the 117 minute thriller feels jammed packed. The plot development become cumbersome and convoluted to the point their importance is overlooked. It is not to say that the developments aren't believable, but detective Craven (Mel Gibson) unfolds them at such an alarming rate by the time you've arrived at the conclusion, your head is spinning. Let's talk for a minute about what I did like about "Edge of Darkness." Number one, it's performances. Mel Gibson returns to acting in a role he's conveyed much of the same emotions before. What's different is his not his temperament or ability, but instead is his overall range and age. Like many great actors, they refine their talents over time, learning and taking from performances through the course of their careers. Mel Gibson brings a performance in Thomas Craven that echos those thoughts exactly. That said, Gibson does not deliver his best performance to date by any means. He does however, deliver exactly what you'd expect him to. Mel Gibson isn't the only person who deserves some praise for his performance in "Edge of Darkness." Both Ray Winstone and Danny Huston delivered skilled portrayals. Winstone in particular is very dominating in his brief role, Jedburgh, while Huston is unmarred as the ever so sly corporate CEO. Their scenes with Mel Gibson are stirring to say the least and end up being some of the best dialogue within the film. Another aspect of "Edge of Darkness" that is worth touting is the action. Albeit limited, there is some very powerful action sequences throughout the thriller. Gibson reminds us that he still has what it takes to win a scuffle, not to mention he's still pretty handy with a gun. The cinematography within the action sequences is enthralling. Too many times, whether it be the editing or the director of photography's decision, action sequences become all to shaky loosing my focus amidst the action. Here director of photography Phil Meheux, does a favorable job of framing the close quarter sequences that could have easily become jumbled. I was really pulling for "Edge of Darkness" to be great, instead it ends up being discarded as missing the mark. It houses a riveting score by Howard Shore, compelling performances along with some hair raising action sequences, but the end result is disappointment. The Martin Campbell directed film just felt to squeezed together. There is just too much unfolding for one film and by the finish line, you are exhausted from trying to keep pace with all of the developments and twists.